It was difficult transitioning from cooking for 2 to cooking for 1 after Joe passed. One of the easy dishes I discovered was Nacho’s. In order to make cheese nacho’s put some tortilla chips on a plate, top with as much Mexican cheese as you like and then nuke until the cheese melts. Voila – Cheese Nachos! You can then top with salsa and/or sour cream. 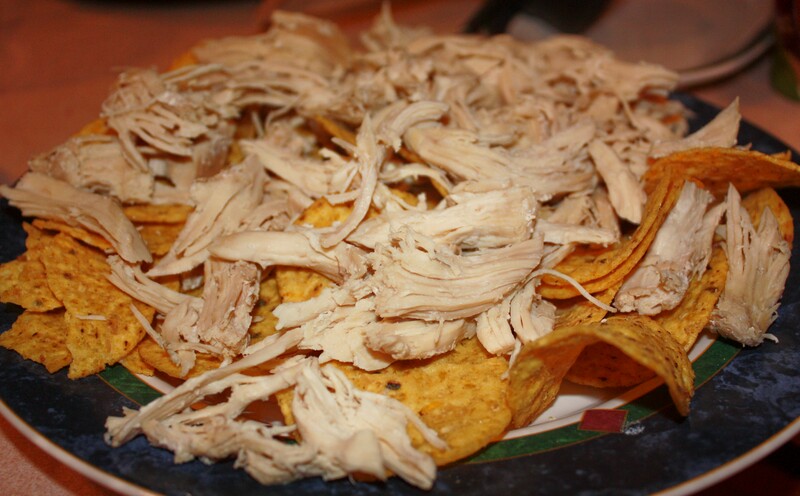 Then one day after cooking chicken in my crock-pot, it dawned on me all I had to do was put shredded chicken on the chips, top with cheese and nuke until the cheese melted and Voila – Chicken Nacho’s! Yes, these are not the fancy nacho’s you find a restaurants but they are easy and quick – except for the crock-pot part. 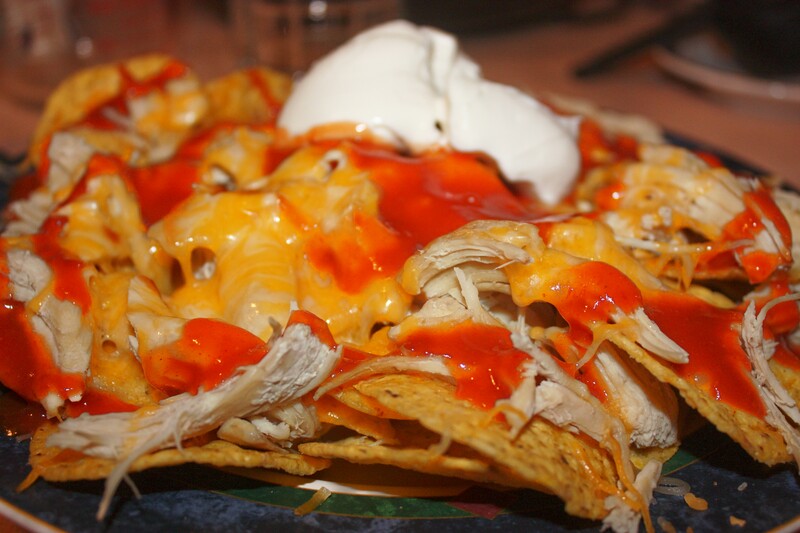 Check back between 7-8 p.m. Eastern and I will show you today’s version of chicken nacho’s. The chicken is cooking in crock-pot. 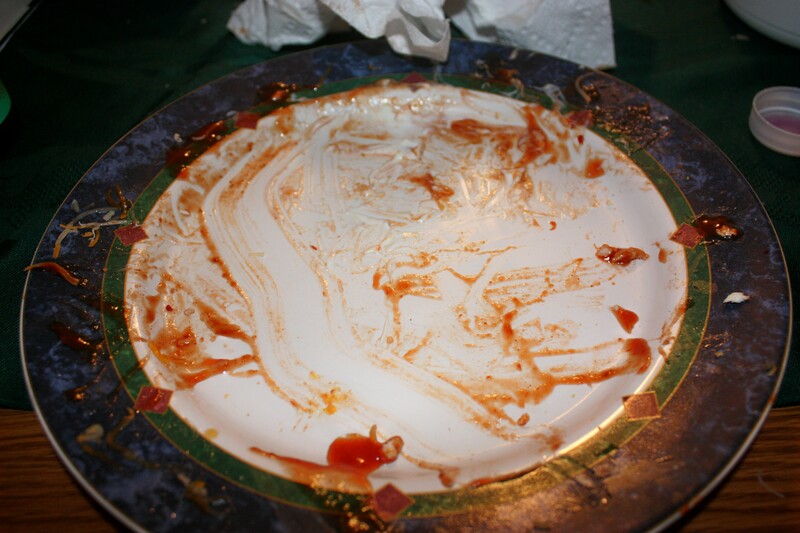 5 napkins later – All Gone! Rommie got chicken nacho’s too. I dropped a couple chips on the floor and then put some chicken in her food dish. Needless to say she scarfed the chips and chicken down and is now one happy dog. Merry Christmas to you and your family from Rommie and me. May you feel that shawl around you and may it warm your heart today and always. Yesterday I was at the grocery store getting the ingredients for the cherry cheesecake tarts and the pumpkin chiffon pie. 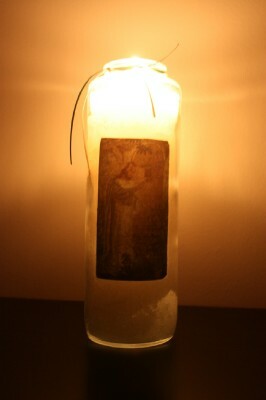 What a lovely way to be like Ralph Waldo Emerson and “Scatter Joy” through out the holiday season. Most people would assume it was a grocery list left by the previous shopper. When they pick up the card to throw it away, they find the message. The cards could be tied to balloons, left on windshields, or left behind on a table in the mall’s food court. There are so many ways this message could be scattered around town. One never knows the impact a little gesture could have on a person. Who knows how many people saw that card yesterday. Hopefully it brought some comfort and joy to them. I know other people saw the card, because I left it in the grocery cart. I was not about to hog that message all for myself. It’s Friday which means another video. May this video from Steven Curtis Chapman speak to you as it did me. Thank you to Sarah blogger at “The Noontimes | Faith Reflections” for sharing this video on December 5th. May you realize how much God loves you, and may you be so overwhelmed by it that you are speechless. You can find the lyrics below the video. Yes, what joy it is to be here to help other people. Whether it is sharing an excerpt from my friend Gabriana’s book, or helping at church by setting up cookies, donuts and hot chocolate for the people who went out caroling. It is a pleasure to make an impact, even in a small way, in other people’s lives. So go help someone this Christmas. It is a great way to help heal from grief or the season’s chaos. I did a lot of thinking today and really do not have much to say. I did find this quote that I wanted to share with you. Stop and share love this holiday season, even in the midst of your grief. Whether you express it to family, friends, animals or even just sit and meditate about God’s love for you. A love so strong, deep and powerful that He gave you His only son. However if you are not feeling love, why not try chanting this over and over until you believe it. Write it down in your gratitude journal today. Besides giving love this holiday season, may you also be blessed with people showering you with love.